Prime Minister of Barbados, Hon. 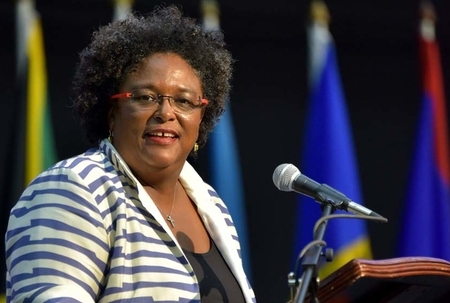 Mia Mottley, addressed the 39th Regular Meeting of the Conference of Heads of Government, which opened on 4 July in Montego Bay, Jamaica and reminded of the “purpose and passion” of the integration movement. Stating that the purpose and passion was the people, she cautioned that they, particularly the young ones, would not wait around for much longer for results. Time is “running out”, she said. The Prime Minister singled out a number of areas for immediate action, including the single domestic space for hassle free intra-regional travel. “The Single domestic space for hassle intra-regional travel must be a place where we must start if we are serious about the single market and the single economy, [and] It must be the place if we want the buy-in of our citizens”, she said. The Prime Minister noted that a single domestic space for hassle free travel presupposes a single domestic space for transportation. To this end she charged her fellow Heads to address the concerns related to the regional airlines LIAT and Caribbean Airways, asserting that the Region "could do better with respect to moving people between island to island and country to country", in 2018.